Disabled people, world-wide, have always found it difficult to make their voices heard. Fortunately, disabled people in the City of Newcastle have the advantage of being able to link with an energetic, vocal and tireless group of disabled people who are working to destroy the barriers which prevent disabled people from living the full and independent lives to which they are entitled. 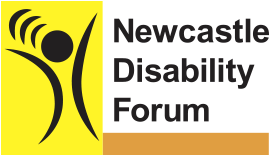 Newcastle Disability Forum (NDF) represents and draws its membership from people with any physical or sensory impairment, carers of disabled people and other interested people. Many of its members also represent other organisations. Underpinning the Forum’s philosophy and activities are a commitment to a multi-disability approach, anti-racism / equal opportunities and the Social Model of Disability.